Reliance - Is it Right Time to Buy? Reliance was a darling bet for any stock investor and people took pride in holding the stock. However like politics their is no permanent friend or foe and same way stock market also do not advise getting married to the stocks as one has to be dynamic in approach to get in or out of the stock at the right time. 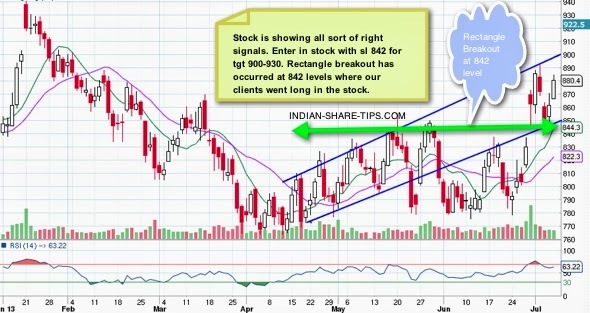 Reliance is presently providing all the right signals and one can go long in the stock with a stop loss in near term as 870 and can reverse the strategy below 870 for target 850- 842 levels. The stock is showing a rising trend channel and is breaking out of the rectangle with base at 842 levels. Firstly, Stock has broken out of the rectangle formation after a long time of consolidation. Secondly it is showing a positive volume balance which means that stock is moving on the higher side with higher volume or increasing volume when compared with previous days volume during its consolidation phase. Stock is recommended for a target of 900-930-1050-1150 and higher levels and holding period ranges from short term to medium term. Do remember to check our short term holding stocks for making real money in market and use our hot stock of the day to make money in intraday trading as real profit lies in trading less. The above post is made on 07 Jul 13 and if you like our efforts do spread the word in your social circle. Our clients are long in the stock.